A Shy Guy Airtub DX is a Dreamy Shy Guy-manned airship that appears in Mario & Luigi: Dream Team. They are created during battle by Dreamy Bowser. The Shy Guy Airtub DX is an enhanced version of the Shy Guy Airtub. Due to it being a background enemy after its opening attack, it doesn't appear on the field, so a Taunt Ball must be used if the player wants to fight it head-on if they fail to defeat it in its opening attack. 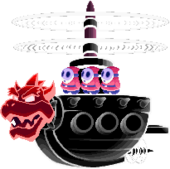 Three red, flashy Dreamy Shy Guys riding on a black mini-airship with three cannons on each side and a red big one in the front that resembles a Bowser head. As its opening attack or if it is struck with a Taunt Ball, the Shy Guy Airtub DX will chase Luigi as the Bowser head of the Shy Guy Airtub DX fires flames at him. While on the airship, Mario must repeatedly attack the Shy Guy Airtub DX after (presumably) getting through the Dreamy Shy Guys with his hammer while Luigi jumps over the fireballs it generates. The Shy Guy Airtub DX will go into the background if it either hits Luigi or survives this attack long enough, and will shoot cannonballs every turn. The left cannon on the ship will shoot cannonballs at Mario, the right one at Luigi, and the middle one will simply not hit anyone. These cannonballs will damage the Shy Guy Airtub DX if successfully struck back by the targeted bro with a hammer. Spanish Superhelibote Shy Guy From the prefix super-, hélice (propeller), bote (boat) and Shy Guy. This page was last edited on December 17, 2018, at 07:46.